Inventory We are a resale marketplace, not a box office or venue. Ticket prices may exceed face value. This site is not owned by Fort Worth Convention Center Arena . The Fort Worth Convention Center Arena opened in 1968 as the Tarrant County Convention Center and has been providing the Dallas/Fort Worth area with concerts and events for almost 50 years. The arena has been expanded on numerous occasions to its current seating capacity of 11,200. 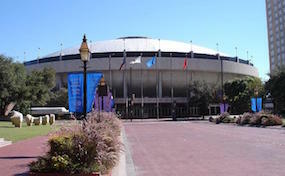 The Fort Worth Convention Center Arena box office is located at 1201 Houston Street in downtown Forth Worth. Event tickets have included legendary acts like Bob Dylan, Metallica, and the Rolling Stones. The Fort Worth Arena was also home to the San Antonio Spurs temporarily. FortWorthConvention.CenterArena.com is an independently owned and operated company that concentrates solely in the online retail of all events in the secondary ticket market. We are not associated of affiliated with any primary box office, venue, and or official site. Ticket prices for events may be above or below face value and can change quickly with market conditions. To order tickets to all Fort Worth Convention Center Arena events please follow the steps online through checkout or call our friendly operators at anytime.